This ball is absolutely phenomenal. My initial gut feeling prior to testing was I was going to like this ball a lot and it far exceeded my expectations. I tested the Idol Pearl shortly after the Winner Solid so they're was substantial transition on the lane. The Idol Pearl was extremely clean, got down the lane, reserved energy and was strong off the spot. I found this ball very controllable and forgiving. I missed left, right and hit it perfectly and was able to get to the pocket consistently. I plan on incorporating this ball into my arsenal immediately and have it replace my Soniq (which I, also, love). I did find the Idol Pearl to be a stronger lower RG pearl than the Soniq. I, also, found it gave me a lot more room for error. I drilled my IDOL PEARL up 75/4.5/25. This put the pin about 2" above my ring finger and just slightly right of it. I went ahead and left the surface box finish to see where it fit in my arsenal before I make adjustments with it. I got a chance to put it in play on a house pattern at my drillers center with a couple of other balls that I had with me. The IDOL PEARL got online very easily without forcing it and had a strong arcing reaction. The fresh shine made it whippy off the spot when I forced it wide, but after a few more shots on the lane it blended out easier. I put it up against my PHYSIX and my SONIC. The IDOL PEARL is about 4 and 2 stronger than my SONIC that I have taken down using 1500/3000 abralon. It was also about 5 and 2 weaker than my PHYSIX that has some lane shine on it but still moves pretty good off the spot on defined friction like this house pattern. I can see the IDOL PEARL being a ball that with a slight removal of the factory shine should put it right in between the HYROAD X and original IDOL. The low RG will get it to rev up slightly earlier along with the Nano cover to help. The new ball in the Roto Grip HP3 line is the IDOL Pearl. I absolutley love the original IDOL, so I was pretty excited to see the IDOL Pearl come out. I drilled mine exactly like the original Idol, 5 x 4.25 x 4.75 pin down. The best thing for me was that the Idol was a little early in fronts and strong midlane roll and just a arc motion downlane. Which was a great motion, but later in blocks or 3rd game the Idol kinda started to labor and loss carry. The Idol Pearl is the perfect compliment as it has similar motion but much cleaner and stronger motion down lane. At the Storm Matchmakers this season the Idol Pearl has been very popular with all styles of bowlers. Also has great shelve appeal with the bright blue color. The Idol Pearl is Roto’s newest release in the HP3 line, featuring the same Ikon core as the Idol, BUT with the Pearl version of the Hyper Cell Fused coverstock. Because of this, I find that the Idol Pearl actually shares more in common with the Fused than the Idol. Like the Fused, it’s very very clean through the fronts, and sharp and readable on the backend, but with a bit straighter motion rather than a continuous one. With it lacking the asym torque, it’s not quite as early or firm downlane, but it’s a ball that you can control every part of the motion with, it responds incredibly well to speed, rev, and hand position changes and will do exactly what you want it to. Personally, I’m very disappointed in the fact that it’s not the pearl version of the Idol cover, I was excited for a truer compliment, but for me they’re so different that I feel the Marvel Pearl is a closer reaction to the original than the Idol Pearl is. The Idol Pearl is the ball I’ve been waiting on since I first threw my Idol. I LOVE the Idol, but it’s too early, strong at times. The Idol Pearl is the perfect solution to that. Same Idol motion, but just a little cleaner with more backend. It’s as simple as that. It’s a great strong symmetrical pearl. The ultra popular Roto Grip was the strongest symmetrical ball that I have ever thrown, in fact I have 2 of them because they are so versatile. Everyone always asked when the pearl version was coming out, well wait no more. I drilled my 5 x 5 x 3, This ball is much cleaner than the original Idol and so much stronger on the back end. The Idol Pearl is about 4-2 weaker than the Idol, it actually fits just after the Hyper Cell Fused making this a very helpful 3 ball arsenal! 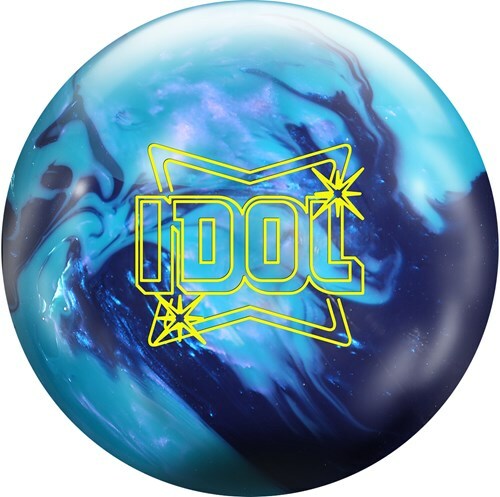 The Idol Pearl is the follow up to the Idol, which I think is the most versatile Roto Grip ball in the lineup. I plan for this to be the strongest Symmetric Pearl in my arsenal. Set it up at 70x4x35, assumed this would be long and angular with my style (400ish revs, 16mph ball speed). First thing I noticed was how smooth the ball is. Still strong, but so smooth and easy to control. Second thing, this ball carries really well for a symmetric ball. I tend to carry better with asymmetric stuff and this ball fights through the pins, a lot like my Physix (my favorite Storm/Roto Grip piece at the moment). I am sure this ball will end up being a favorite of a lot of bowlers. The Idol Pearl is the perfect complement to the Idol in RotoGrip’s HP3 line of bowling balls. The Idol Pearl boasts the eTrax-P18 Pearl coverstock that generates tremendous backend force. While the Ikon weight block with its Low RG (2.49) will keep the length under control. The combination of the two is pure poetry in motion… Dynamic mid lane control with devastating power through the pins on the backend! The Idol Pearl fits in when the Idol is just too much too early. From throwing both bowling balls and also the IQ Tour and Winner on a house pattern. There was noticeable differences between all four bowling balls. The IQ Tour was the most readable and controlled. The Idol was stronger and more aggressive. The Winner was the weakest bowling ball in the bunch. No surprise so far. The Idol Pearl actually give me the best look on the medium to dry house pattern. I have a relative low rev rate (300), medium ball speed (15-16mph) and I like to get as close to the friction as possible. So the Idol and IQ Tour was forcing me left because of the early roll and my angles got steep. The overall motion of the IQ Tour and Idol were just too smooth from losing energy too early. The Winner had too much over under because of the RG value being higher… Skid snap reaction is not really good on fresh! The Idol Pearl was the happy medium. The Idol Pearl was not too erratic when I got it to the dry too early and was strong enough when I missed left into the juice. I was pleasantly surprised by the overall performance of the Idol Pearl from start to finish. The carry down and heads vanishing was not a problem for the Idol Pearl. You cannot go wrong with HP3 line of bowling balls from the early rolling Idol to the backend monster of the Idol Pearl. RotoGrip has you covered! The Roto Grip Idol Pearl utilizes the Ikon Core and e-Trax P-18 pearl coverstock. This ball sure does catch your eye with its blue pearl coverstock. It will catch your eye based on the performance as well. With that said, the Roto Grip Idol Pearl was fantastic during testing. The pearl coverstock lets the Idol Pearl get through the heads easily. We did not notice any skate when we tugged it in the oil and plenty of recovery on misses right, which should make this ball usable on a lot of conditions. For a pearl coverstock the Idol Pearl handled the oil very well. I could see us speed challenged players having to put this ball up when the heads burn up. I experienced this one night in league when I had to force the ball down the lane. In reality, having too much motor is not a bad thing. I would describe the Idol Pearl as a more controllable Storm SoniQ. The Idol Pearl will fit between my Idol (2000-grit) and my polished Winner Solid. This is a great addition to the HP3 line and will make a good ball for mid to late in a block. The Idol Pearl will continue where the Idol left off. When i drilled the Idol it was a quick favorite in my bag. So when i heard about the Idol Pearl i was really excited to see what this ball would do. I went with a 4.5 x 35 layout and this ball doesn't disappoint you! I was missing a strong pearl in my bag in the mid range stuff since i stopped using my dare devil. The Idol pearl is a great replacement for that ball. For a pearl it's reads the mid lane very well and off the spot this ball pops hard. If you're looking for a pearl to add in your line up this is a great choice! The Idol Pearl is a wonderful compliment to the Idol. I found that sometimes the Idol was too smooth a ball reaction. When the Idol begins to labor or become too smooth off the end of the pattern. The Idol Pearl will allow you to move your feet a few boards left and get more continuation through the pins. In the past, pearl balls that continue a series have been too sharp off the spot. Not this one. The Idol Pearl has more downlane motion than the Idol, but it’s very forward off the spot. In my opinion, the Idol Pearl allows me to control the pocket better than other pearls because of its forwardness off the spot. This ball is a must have in the bag because it’s a great benchmark pearl ball! The Roto Grip Idol Pearl is Roto Grips newest HP3 line release. The Idol Pearl is covered with the eTrax-P18 pearl stock and is finished at 1500 Grit polish. The Core is the Symmetrical Ikon Core which is also found in the original Idol. I drilled my Idol pearl with the pin and CG stacked below my bridge. This is the same layout I put on my No Rules Pearl. My intention was to replace the No Rules Pearl but after throwing the Idol Pearl, the Idol is a few boards weaker. The pin down reaction really smoothed out the back end reaction on the Idol Pearl. The ball gives me a great look between first arrow and third arrow especially on fresher patterns. Once the lanes start to break down and I have to move in I’ve found that I start to lose carry or the ball reads too early on the broken down heads and I have a hard time keeping the ball in the pocket. The Idol Pearl is a great compliment to the original Idol. As far as solid/pearl combos, the Idols might be my favorite one. The newest addition to the Roto Grip HP3 line is the Idol Pearl. I am a big fan of the solid version of the Idol and the pearl is just as good. I think the Idol Pearl compliments the solid version perfectly. Also, this is the strongest pearl ball I’ve ever thrown. This is a ball I will be able to throw on several different patterns and have a ton of confidence in as I pull it out of the bag. I’ve drilled one so far and used one of my standard layouts. It’s mapped out as 5 x 4.5 and I took the surface to 3000 by hand. This puts the pin above my bridge and is a cleaner, more angular version of the original Idol. I’ve been able to use the Idol Pearl on multiple patterns, but they must have volume. Because the Idol Pearl is the strongest pearl I’ve thrown, it’s been a perfect step down from the Idol, but still stronger than the Winner Solid and Match-Up line. The Idol Pearl also fits nicely underneath the asymmetric balls, especially if they run out of gas and you need a quicker response time. If you need a ball that changes direction quicker than your bigger cored, asymmetrical balls, the Idol Pearl is a perfect fit.